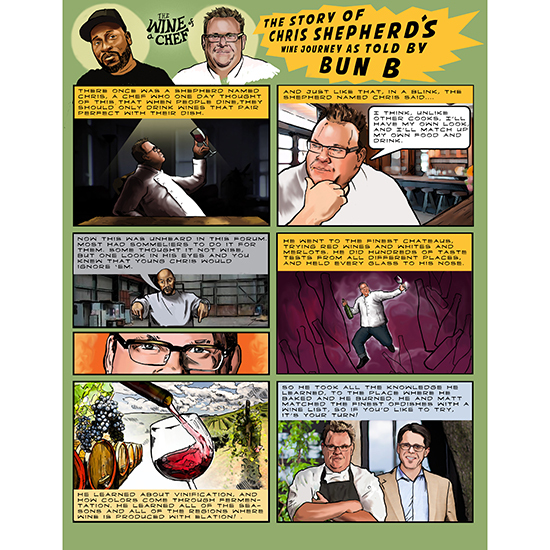 For Underbelly's great new wine list, chef Chris Shepherd collaborated with an unexpected talent: Houston rapper Bun B. At the Food & Wine Classic in Aspen last year, I sat down for a few minutes one afternoon to chat with my fellow Houstonian Chris Shepherd, the insanely talented cook and owner of Houston's acclaimed Underbelly restaurant and 2013 F&W Best New Chef. Somehow the conversation turned to the wine lists and how boring a lot of them are, and I think eventually we both decided how interesting it’d be if he took his wine list to the next level. I didn’t think much more about that, but clearly Shepherd did. At least, that’s my takeaway from looking at the new Underbelly wine list, which is partly a comic strip about Shepherd’s life in wine and partly a wackitudinous, opinion-filled, quasi-magazine that also happens to tell you what wines you could have with your pecan-smoked beef neck or cha cha-style snapper; it's also partly a completely unlikely collaboration with legendary Houston rapper Bun B (Underbelly wine director Matthew Pridgen plays a big role in it, too). Soon, the two were in the back of the restaurant with 20 bottles of wine. "We did two or three 3-hour sessions," Shepherd says. "Hearing Bun's version, what comes out of his mouth while he's tasting, was so cool."